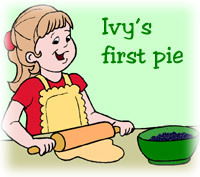 1 Ivy made her first pie on Friday. It was a blackberry pie. First, she made the crust. Next, Ivy mixed the blackberry filling. She put the blackberries in a bowl and added the sugar and spices. She mixed this together with a spoon. Finally, she put the berries in the piecrust. 2 Ivy baked the pie until it was just right. Everyone in Ivy's family could smell the delicious blackberry pie. They all wanted to try it. 3 Ivy's family ate supper first. After supper, they were too full to have pie. Everyone decided to try the pie later that night. Ivy and her brother, Mike, played hide and seek outside for a while. 4 After a while, it was time to taste Ivy's pie. Everyone sat down at the table. Mom sliced the pie. She put a big slice of pie on Mike's plate. She put a big slice of pie on Ivy's plate. She gave Dad a big slice and took one for herself.